American lunar flyby probe. 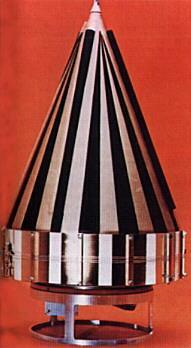 Smaller than the previous Pioneers, Pioneer 3 and 4 each carried only a single experiment to detect cosmic radiation. Status: Operational 1958. First Launch: 1958-12-06. Last Launch: 1959-03-03. Number: 2 . Gross mass: 6.00 kg (13.20 lb). Height: 0.51 m (1.67 ft). Both vehicles were planned to fly by the moon and return data about the Earth and Moon's radiation environment. Following the unsuccessful USAF/NASA Pioneer 0, 1, and 2 lunar missions, the U. S. Army and NASA launched two more lunar missions. The launch of Pioneer 3 failed when the launch vehicle first's stage cut-off prematurely. Although Pioneer 3 did not achieve escape velocity, it reached an altitude of 102,332 km and discovered a second radiation belt around Earth. The launch of Pioneer 4 was successful, and Pioneer 4 was the first American spacecraft to escape Earth's gravitational pull as it passed within 58,983 km of the moon (about twice the planned flyby altitude). The spacecraft did return data on the Moon radiation environment, although the desire to be the first man-made vehicle to fly past the moon was lost when the Soviet Union's Luna 1 passed by the Moon several weeks before Pioneer 4. The spacecraft was battery powered and used passive thermal control (a paint pattern on the external surface of its Fiberglass structure). The payload included two Geiger counters and a camera trigger mechanism as a test (no camera was carried). Pioneer 3, 4 Lunar flyby satellite built by Jet Propulsion Laboratory (JPL) for NASA, USA. Launched 1958 - 1959. Family: Lunar Flyby, Moon. Country: USA. Launch Vehicles: Jupiter IRBM, Juno II. Projects: Pioneer series. Launch Sites: Cape Canaveral, Cape Canaveral LC5. Agency: JPL, NASA, US Army. Bibliography: 16, 2, 279, 6. 1958 December 6 - . 05:44 GMT - . Launch Site: Cape Canaveral. Launch Complex: Cape Canaveral LC5. LV Family: Jupiter. Launch Vehicle: Juno II. FAILURE: First Stage shut down too early. Partial Failure.. Failed Stage: 1. Pioneer 3 - . Mass: 6.00 kg (13.20 lb). Nation: USA. Agency: NASA. Program: Pioneer. Class: Moon. Type: Lunar probe. Spacecraft: Pioneer 3-4. Decay Date: 1958-12-07 . USAF Sat Cat: 111 . COSPAR: 1958-Theta-1. Failed to reach moon; provided radiation data. Pioneer III , the third U.S.-IGY intended lunar probe under the direction of NASA with the Army acting as executive agent, was launched from the Atlantic Missile Range by a Juno II rocket. The primary objective, to place the 12.95 pound scientific payload in the vicinity of the moon, failed. Pioneer III reached an altitude of approximately 70,000 miles and revealed that the earth's radiation belt comprised at least two distinct bands. 1959 March 3 - . 05:10 GMT - . Launch Site: Cape Canaveral. Launch Complex: Cape Canaveral LC5. LV Family: Jupiter. Launch Vehicle: Juno II. Pioneer 4 - . Mass: 6.00 kg (13.20 lb). Nation: USA. Agency: NASA. Program: Pioneer. Class: Moon. Type: Lunar probe. Spacecraft: Pioneer 3-4. USAF Sat Cat: 113 . COSPAR: 1959-Nu-1. The fourth U.S.-IGY lunar probe effort, Pioneer IV , a joint project of the Army Ballistic Missile Agency and Jet Propulsion Laboratory under the direction of NASA, was launched by a Juno II rocket from the Atlantic Missile Range. Intended to impact on the lunar surface, Pioneer IV achieved earth-moon trajectory, passing within 60,200 km of the moon before going into permanent orbit around the sun.